Nokia unveils N1 Android tablet | What Hi-Fi? With the Nokia smartphone now a thing of the past after the mobile brand was acquired by US computing giant Microsoft, the Finnish company has now turned to producing its first, branded Android tablet – the N1. The device - looking strikingly similar to the iPad Mini 3 - sports a 7.9in laminated display with a 4:3 ratio and 2048 x 1536 resolution, which results in 324ppi. It's also incredibly slim; 6.9mm thin in fact. And the N1 is powered by a 64-bit 2.4GHz Intel Atom quad-core processor, with 2GB of RAM and 32GB of onboard storage to boot. The N1 comes running Android 5.0 Lollipop out of the box, but Nokia has layered its own Z Launcher over the top. The company says this interface will learn personal habits, with users able to "scribble a letter or two to find their content quickly." Nokia also says the tablet will be able to predict and highlight apps that it expects users to want based on time of day and location. An 8MP camera can be found on the rear of the device, with a 5MP camera located on the front. Under the cover, you'll find a 5300mAh battery and the N1's 0.5W stereo speakers round off the specs. "The N1 has a delightfully intuitive interface and an industrial design to match it. This is a great product for Nokia fans and everyone who has not found the right Android tablet yet." 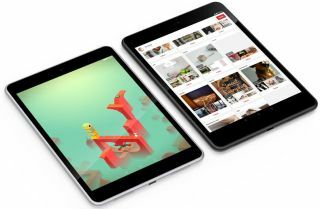 The Nokia N1 will be available in Lava Grey and Space Aluminium finishes and will cost $249 when it launches, with the Chinese market getting it first on 19th February. A worldwide launch will follow soon after.